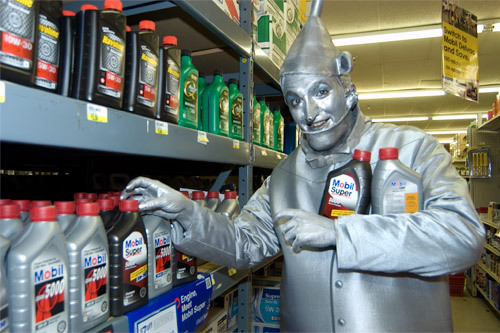 Oz Theme Continues for Aberdeen Promotion | McQuillen Creative Group, Inc.
Rory Behrens (aka Tin Man) "buys" oil at Runnings in Aberdeen. If you’ve seen the Broadway sensation, Wicked, you probably remember how each Oz character came to be. Unfortunately, the production is 100% incorrect in relating how the Scarecrow and Tin Man came to be. The Tin Man was named Nick Chopper and he was a normal dude. He fell in love with a sorcerer’s daughter who disapproved of him. The sorcerer put a spell on him that caused him to cut off his limbs while cutting trees. Eventually he was completely replaced with tin. And in the land of Oz, flesh and blood does not a person make. The Scarecrow was made by a munchkin and just happened to be alive. To make a long story short, the author of the Oz tales (14 books in total) lived in Aberdeen from 1889 to 1891, Aberdeen’s formative years (we were platted in 1880). He DID NOT write the Wonderful Wizard of Oz while living here but he did create enough of a sensation so that we, today, draw on his connection as a way to promote uniqueness about Aberdeen. And his connection really helped the development of our famed Storybook Land. In a previous post I mentioned that McQuillen Creative was tasked with making TV commercials featuring Oz characters in situations experienced by visitors to our community. A campaign exists to attract folks from a 100 mile radius to Aberdeen for their weekend shopping, entertainment and recreation. Two commercials were made in March (see Return to Oz) and we just completed the Tin Man installment a few weeks ago. The Tin Man was a bit more involved than the previous two because we shot in multiple locations around Aberdeen (Runnings, Wylie Lake, Storybook Land, etc.). The day-long make up experience posed new challenges, but actor Rory Behrens stuck it out for nearly 8 hours. He was made up once again by Aberdeen Community Theatre’s Heidi Jensen. MCG Video Director Bill Feitag wrote, directed and edited the 30 second spot. There seems to be a fair amount of buzz around town about the commercials. The City Marketing committee is doing a great job placing them on appropriate TV programming. Talk to us about TV commercials that stand out. Call us at 605-226-3481.